I was reminded this evening of the sudden loss of my dog, Hanna on February 13, 2011. The reminder came in the form of an online petition from a young woman who lost her dog recently. Her dog and my dog died. She knows her dog was essentially poisoned by a treat manufactured in China for Nestle Purina. I have always suspected my Hanna died of some form of poisoning. I suspected a Nestle Purina product, but testing did not reveal any toxin in the sample. The petition calls for Nestle Purina to stop the distribution of this particular treat which has been implicated in the deaths of many dogs, I gather. This entry was posted on April 7, 2012, 01:15 and is filed under Uncategorized. You can follow any responses to this entry through RSS 2.0. You can leave a response, or trackback from your own site. I am so sorry for your loss. I am not sure you have more pets, but I have two cats. So, I understand how losing a pet, because they are like part of your family. I feed my cats raw food; they have it for dogs too (Darwins food). This food is a miracle food source. Don’t laugh it is true. Even my vet is now convinced. I have for years been deathly allergic to cats and dogs. Why they have dander. Well, they shouldn’t. It is because the food on the market is processed crap that we can’t even eat it. Why would you feed your pet something that we can’t eat. We can eat our cat food – gross. But we can, if we cook it. My point is the food is not processed. No additives, no fillers. Pure protein. This is what animals in nature would eat. My vet says our cats are the healthy he has ever seen. They have no dander, no fat, and have solid muscles, and fur so soft like silk. Our friends who have pets both cats and dogs have switched. No longer am I allergic to cats, mine because of the food, and their animals because of the food source, They also get very little hard organic, all meat not processed, no filler stuff to. Not only is the food good for your pets, they don’t have vet bills they go when needed as kittens. No more. They have no issues, and the same is said for our friends with dogs. One final note, never ever feed your dogs table scraps. This will kill them. Our food system is bad and you are right to think that your food was bad. I am so terribly sorry for your loss. Your dog was adorable. Keep what I said in mind in the future and pass the word around. it is true. they have a web page so you can look them up. Again, sorry for your loss. Thanks! I’ll consider that. 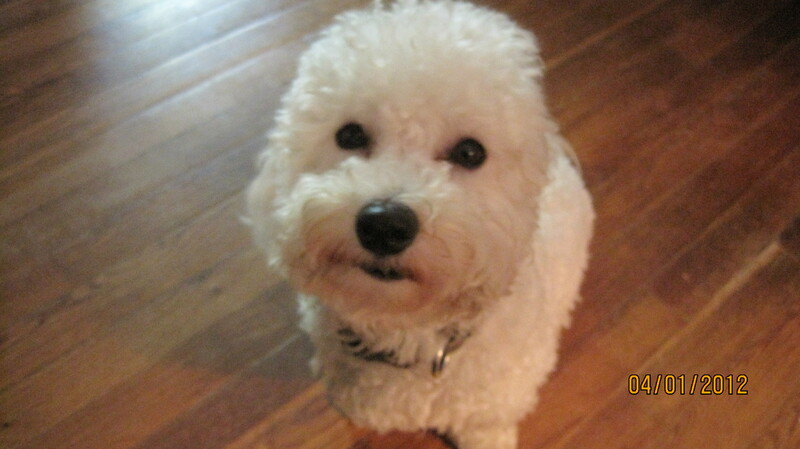 I stopped using Nestle’s Purina foods; I feed my two Bichons — that’s Hank in the pic, not Hanna — Eukunuba small breed puppy and small bite maintenance adult foods. I agree about table scraps — not good for dogs! Obviously I do have two dogs now — both Bichon Frise boys! “Hank” and “Robi” — they are gorgeous! And adorable!